Today's challenge theme was gradient! I decided to do an ombre gradient between the five nails on one hand, because I had done the gradient on the yellow day of the challenge already. I only used one base color for this look: Sparrow Me the Drama from the OPI Pirates of the Caribbean Collection. It's a pretty pink - fairly standard but a little dustier than a regular Barbie pink. Now, let's find out how I did it, shall we? Whenever I'm doing my nails I always put down a sheet of wax paper, because the table I work at is super nice! The wax paper seems to do well with spills and stuff. Note: you could probably use the brush from the bottle of your base color, as long as you are very careful to clean it several times throughout this process. And try not to ever get any acetone in your bottle, as it can ruin nail polish! Start by painting your nails with your base coat. I tried out CND Stickey for the first time for this mani! Let dry. 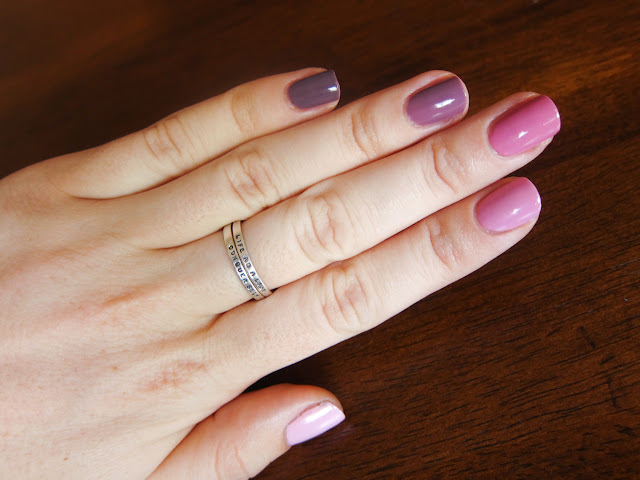 Add your base color to the nail on your middle finger. Do both hands at the same time. Pour some of the base color into one of the wells on your palette. I started going in the darker direction first by adding ONE DROP of the black to your color. The color will get darker very quickly so start with one drop and see if you like it from there. Mix with your extra brush, and paint onto the nails next to your middle finger. Make sure to do your other hand, too! Repeat by adding another drop or so of the black polish, and paint onto the next nails on your hand. Clean your brush off with some acetone, as we are going to be going lighter now. Fill another palette well with some of your base color. I found that you need a lot more white to make the color lighter than you needed black to make it darker. Mix in white until you are happy with the color, and paint on the other nail next to your middle finger. (Do both hands. Just sayin'!) Repeat by adding more white to your already-mixed-mixture and paint on your final finger. Top with topcoat of choice! On a sort of related note (you'll see where I'm going with this in a second), I found the Wet N Wild On the Prowl collection yesterday! It's a semi hard to find limited edition Halloween collection. I found mine in CVS, but it's tricky, because each individual store can choose whether or not they want to carry it, as well as when they want to set it out. It can get super frustrating to find! Because I was so excited about it, I wanted to try out Tangled In My Web, a black hex glitter polish. I thought putting it over an ombre was a great way to give you guys 5 different swatches of it, too! I just love this look! It's so unique and random and unpredictable, in the best of ways. Love this. I need to go to CVS asap. I only want 2 from On The Prowl, hopefully they have the ones i want! This is really awesome! I need to try this gradient mani! Thanks everyone, I'm glad you like it! Good luck to all of you hunting for On The Prowl... it took me a long while to finally get my hands on it. Hopefully you will have an easier time than I! This is gorgeous! I have to try it someday. Love it! I want Tangled in My Web so bad! I love it! :) neat idea, I've heard of people doing that, but it was cool to actually see how. Where did you get your ring from? That is gorgeous! 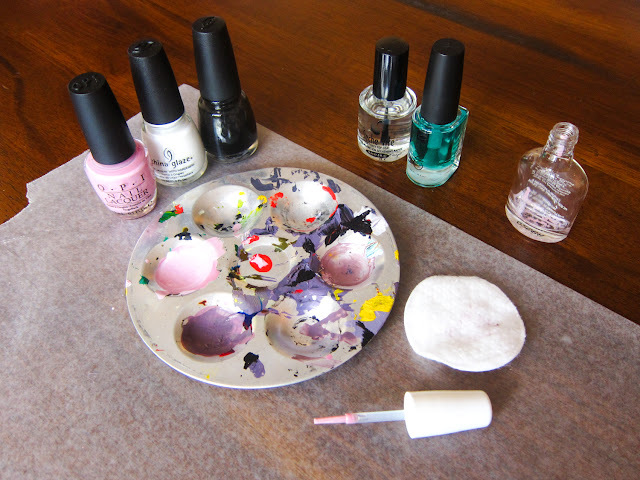 I never would have thought of mixing the nail polish, so finding this tutorial made my evening! One way to use less white nail polish though is to add the base color to the white, instead of the other way around. Looks like nail polish works like paint in that aspect. Glad I'm not the only one who loves your ring. Where did you get it? They are the "Tiny text - thin posey rings." I have two of them! I gifted myself one per each 20 pounds that I lost when I was going through my weight loss journey. I’ve never tried a really ombre but your description makes it sound very easy. I definitely want to try it now. It's interesting how the darker colors bring out the purple/taupe side of SMtD. The whole look is amazing, SMtD s a great color for this! It's so pretty & so easy! I might try this out later! Oh wow...I would have never thought to add black to a light color to do the ombre...I have done the reverse...start with a dark color and add white to go lighter and lighter. This is a cool spin on it.